ELECTORAL Pertaining to election or electors. The electoral college in Germany consisted of all the electors of the empire, being nine in number, six secular princes and three archbishops. 1. In a general sense, a collection, assemblage or society of men, invested with certain powers and rights, performing certain duties or engaged in some common employment or pursuit. I use the expression electoral system. The Electoral College in the United States seems to correspond to the common definition as described by Noah Webster with the exception that the United States electors are only appointed temporarily while the electors in other countries appear to be more permanent in nature. 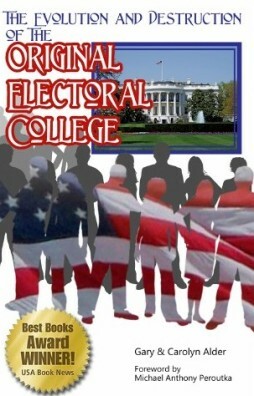 The original version of the electoral college functioned so differently than what we have today that to understand it we need to forget most of what we know about the electoral college and start with a clear mind. To begin with let us describe the general structure of any election. 1. A certain number of wise men from each state were to recommend the best candidates for President (the nomination process). 2. Candidate selection was to take place by the counting of the nominations. This was to happen in a combined meeting of the House and the Senate. If the above nomination were overwhelmingly in favor of a particular candidate he would become President, bypassing the deciding vote of the House of Representatives. 3. In the absence of an overwhelming nomination for a particular candidate, the President would be chosen from up to 5 favorites of the Electors by the House of Representatives with each state casting 1 vote. Notice that only the number of Electors for each state is determined by following these instructions. The actual senators and representatives in office are precluded from involvement. The Framers were very careful to be sure that no special privileges were to be given in the nominating process to support the incumbent advantage in either the position of president and vice-president or to those then serving in the House of Representatives or the Senate since these bodies would cast the final votes for the President and the Vice-President respectively. In fact any elected official or federal government employee is also precluded from being an Elector. They really wanted to protect against setting up a system for any kind of political payoff. So there was one body to nominate the presidential candidates (the Electors), and a separate body to elect the President (the House of Representatives). The vice-president would always be the remaining candidate with the most electoral votes after the president was selected. Only a tie in this situation would be decided by the Senate. We can plainly see that in the general sense, anyone who is qualified to vote is an elector. However there is a special position in the United States selected to vote for a presidential candidate which nowadays is the common way we use the word elector-a presidential elector. The question remaining is who actually should nominate or determine who are to be the candidates. Let us look at Article II Section 1 Clause 3 to answer the question. This is the end of the Electors’ term of service — one meeting of all the Electors of a state. It is significant to note that there was to be no connection with the Electors of other states, no campaigning, no trading of votes for future influence or supporting your program if you support mine. They were to give it their best shot first because that was the only shot they got. Do we have any evidence that there was a pre-printed ballot? Of course not. That would pre-suppose a separate nominating process. Each Elector wrote down two names. In other words they named or nominated two candidates for president. Every time we write-in a candidate we nominate that candidate. Pre-printed ballots would be proof that there was a separate nominating process. If there were to be a separate nominating process and that process were not described in detail in the Constitution that fact alone would be evidence of a serious design flaw in the Constitution. In fact the Electors met in their separate states on the same day to avoid the chance of collaborating with the Electors from other states during this process. It appears that the Electors were able to freely discuss among themselves which individuals were to be nominated by their own state. They were not however, forced to conform to the nominations of other Electors from their state. There was no winner-take-all attitude at this level. That would be contrary to the concept of nomination. Each individual Elector’s decision of whom to nominate was preserved and respected. The Electors were not to be influenced by men from other states in this function. In this way, the “will” of their state in this matter was also preserved. To protect against the anticipated bias that the Electors would have in favor of only choosing men from their own state, each Elector could nominate no more than one individual from his state. The list of all nominees and the number of votes for each was then transmitted to the Seat of Government for the candidate selection and voting processes. The mode of appointment of the chief magistrate of the United States is almost the only part of the system, of any consequence, which has escaped without severe censure, or which has received the slightest mark of approbation from its opponents. [Little else in the Constitution has escaped criticism and even received approval from those opposed to its passage.] The most plausible of these, who has appeared in print, has even deigned [thought worthy] to admit that the election of the president is pretty well guarded. I venture somewhat further, and hesitate not to affirm, that if the manner of it be not perfect, it is at least excellent. [It sounds like Mr. Hamilton thinks it is a pretty good method.] It unites in an eminent degree all the advantages, the union of which was to be desired. Although the final determination to use the electoral college process to obtain candidates by Mr. Hamilton’s account seemed to be satisfactory and pleasing to all whether in favor of or opposed to the Constitution and its other provisions, the debate in the Constitutional Convention over how to elect a president was one of the most difficult problems that was addressed in the convention. It was desirable, that the sense of the people should operate in the choice of the person to whom so important a trust was to be confided. [This is not to be confused with a vote of the people after hearing the propaganda of a campaign.] This end will be answered by committing the right of making it, not to any preestablished body [such as a political faction or party], but to men chosen by the people for the special purpose, and at the particular conjuncture. It was also peculiarly desirable, to afford as little opportunity as possible to tumult and disorder. [Such as campaigning, making false claims about one’s own virtues, and telling of the real or imagined faults of an opponent] This evil was not least to be dreaded in the election of a magistrate, who was to have so important an agency [responsibility] in the administration of the government, as the president of the United States. But the precautions which have been so happily concerted [working together] in the system under consideration, promise an effectual security against this mischief. The choice of several, to form an intermediate body of Electors [between the people and the candidates], will be much less apt to convulse the community with any extraordinary or violent movements, than the choice of one who was himself to be the final object of the public wishes. [tooting his own horn] And as the Electors, chosen in each state, are to assemble and vote in the State, in which they are chosen, this detached and divided situation will expose them much less to heats and ferments, [campaigning] which might be communicated from them to the people, than if they were all to be convened at one time, in one place. The framers were opposed to demagoguery or rabble rousing. Rather than have one individual that is seeking his own power and advantage, have people who are charged with the responsibility of trying to find worthy candidates. Although there was room for discussion between the Electors of each state, each state’s ballot of nominees was to be independent of the other states’ choices. In other words, at this point of the process no debates were invited to make one state’s choices coordinate with those of any other state or group including political parties or foreign powers. This also demonstrates that the primary concern was to get the best candidates possible in the opinions of the Electors of each state. This certainly is the nature of a nomination process rather than a final choice. There was no requirement that all votes from a state go to the same candidates. The counting of the electoral votes determines the field of candidates to be forwarded to the House for their final selection. A plurality of electoral votes is not sufficient to bypass the election process by the House of Representatives; a majority of the number of Electors is required. This is not the likely result of a nomination process where there is only one ballot done on the same day separately in each state, unless one individual is so much better qualified than all others that it was obvious to the majority of all the Electors. Another way of describing this phenomenon is probably warranted at this point. If the individual nominated with the highest number of votes was nominated by over half of the Electors, no final election is needed. A similar logic is used in our modern party conventions to avoid a primary election for popular candidates. In this situation it seems only intuitive and obvious who should be president. This was the case with our first president, George Washington. In fact, George Washington was unanimously nominated by the Electors in both terms of his presidency. No other president has shared that distinction. John Adams, who was vice-president to George Washington, received a majority of electoral votes in the election of 1796. Technically there could be up to three individuals who could tie with a vote from over half of the Electors because each Elector casts 2 votes. Speaking only of the number of votes, a president could be elected using the shortcut with just over 25% of the votes cast. This makes it sound not quite as impossible as one might otherwise presume. This is to say that an Elector’s second choice on the ballot is as valid in the vote counting as is his first choice. 2) He is the candidate who has the highest level of confidence (not tied). Notice that if the election is to take place in the House, the field of candidates will be 2 or 3 or 5. If the highest number of electoral votes is tied with a number who have received a vote from a majority of the Electors the number will be 2 or 3. Without such majority, the number of presidential candidates will be 5. These are then voted on by the House of Representatives, with each state casting 1 vote. There are some significant details here that require some further examination. Even though the Representatives vote, the small states have as much say as large states when the election goes to the House. This demonstrates that the office of president is not to be confused with a king of the people. He is a president of the states. A majority of the states must vote for the president not merely a plurality. This is a majority of the states, not a majority of the population, or a majority of the Representatives. 1) The nomination process was accomplished by the Electoral College and amounted to a weighted vote. The reason for using the number of senators and representatives rather than only the number of representatives was to give the smaller states more say. In other words, the more populous states have a larger voice although not a proportionally larger voice as to who the candidates for president are to be. 2) The candidate selection was to take place as the nominations were opened and counted in the joint meeting of both houses of Congress. An overwhelming support for a particular candidate coming from the Electors who were not permitted to collude between states was taken as the will of the people and was not to be overridden (the shortcut). 3)Unless a majority of the total number of Electors nominated the same individual, as determined in the joint meeting, the field of up to 5 candidates would go to the House of Representatives where each state would have an equal vote for the president regardless of population. When we were kids our mothers taught us that if we had a cookie or a candy bar and were to share that with a friend we would cut it in half. Our friend would then get to choose his piece first. It is only fair. This is analogous to the situation with the electoral system when it goes to the House. The Electors as representatives of the people choose the candidates. Then the states decide which of those candidates becomes president. One other important detail needs to be explained with regard to the final election in the House. If a state has an even number of Representatives or if by abstaining from a vote one of the Representatives effectively puts a state in that position, a state may come up with a tie and negate its vote. But as a majority of the votes might not always happen to centre on one man and as it might be unsafe to permit less than a majority to be conclusive, it is provided, that in such a contingency, the house of representatives shall select out of the candidates, who shall have the five highest number of votes, the man who in their opinion may be best qualified for the office. It is apparent that the framers were overly optimistic in expecting a consensus of the nominations coming from the Electoral College. Perhaps they thought that George Washington would always be in that office or there was a belief that someone else with an equivalent esteem would rise in the system. In the opinion of the author there is no indication that the selection of a president by the House of Representatives was initially thought to be a big problem even though we often consider it to be so nowadays. -yet we may safely pronounce, that the true test of a good government is its aptitude and tendency to produce a good administration. This speaks to the design of the electoral process as designed in the Constitution. In other words get a good administration with good leaders time after time by the process rather than by politics or just plain luck. In other words if a Senator were chosen as the President of the Senate he could only vote as a tie breaker rather than as a representative of his state. His state therefore would be under represented. If you consider the senators as just another body for passing national legislation or as additional representatives of a party, you wouldn’t get the critical nature of this argument.